Köln, or Cologne, is the largest city in the German state of North Rhine-Westphalia. A group of friends snagged me this weekend to tour this great metropolis–a once devastated city after World War 2. Since then, It has been restored and booms with activity on both sides of the Rhine River. You can find street performers, plenty of beer, museums, shops, and restaurants. 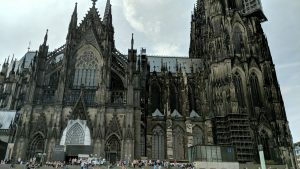 One of the most dazzling sites as you exit the train station is the magnificent Cologne Cathedral that seems to dwarf all other attractions around it. I sat inside this building, stunned by its beauty; I was unable to fathom how such a structure–one of the world’s largest churches–could have been built in 1248. This site, however, is only one aspect of this German city. What especially caught my eye was the community. The city was busy with all sorts of people, tourists and locals, going about their days. 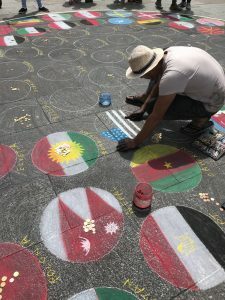 I saw couples enjoying a date walking along the Rhine River; families taking in the view of the metropolis from atop the Köln Triangle, a building that offers a panorama of the city; and a street artist who attracted passersby with his wonderful street chalk drawing of what looked like every country in the world contained in one giant circle. As it worked, you were supposed to drop Euros on your respective country. From this piece, people from Iran, USA, Mexico, Russia, China, South Korea, Australia, and elsewhere had visited this street artist. Especially in such dynamic times, it was comforting to find unabashed and gleeful people indicating from where they were traveling. Earth seems like a big place (relative to us, sure, it really is), but modern technology makes this planet smaller; everyday new developments draw us closer together. Similar to the destruction and reanimation of Cologne, this street artist’s work, everyone’s contribution, and the buzzing city sort of served as a reminder of what potential we have as a global community. We all have our respective identities, and with such precious markers we have a choice whether to build or destroy, love or hate, connect or segregate. I know I choose the former in every case, and I try to make that decision reflect in each aspect of my life. 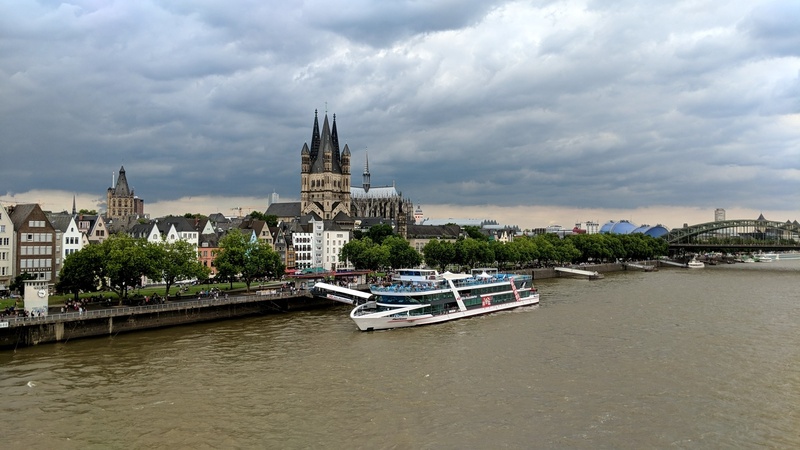 The Cologne Cathedral and other structures in Cologne are reminders of the city’s history–how far it as come. This weekend’s trip refreshed my mind and rekindled on the importance of having grounding, humility, and healthy, connected relationships. I do no know who this street artist was, but thank you. 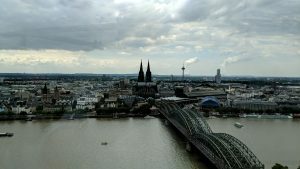 1 Comment to "Weekend Trip to Köln: the Reanimated City"